Bring a touch of nature indoors with the Nature Origami Paper Pack! This outdoor themed origami pack features realistic nature prints on one side and a solid coordinating color on the reverse. Bring a touch of nature indoors with the Nature Origami Paper Pack! This outdoor themed origami pack by Avenue Mandarine features realistic nature prints on one side and a solid coordinating color on the reverse. 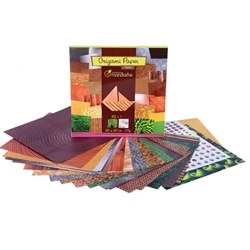 From rich wood grains to grass blades and bamboo, you are sure to find the perfect natural-looking origami paper for your project!